‘Thespian’ is a word that was exclusively coined by media to describe the acting genius of Bollywood First Superstar Dilip Kumar, who indeed is a colossus of Indian Cinema. After Dilip Kumar the other actor who has been bestowed with this prestigious title is none other but Sivaji Ganesan, the iconic actor of Tamil cinema also referred to as 'The Marlon Brando of Indian Cinema’. Incidentally after Dilip Kumar and Sivaji Ganesan no actor has been fortunate enough to earn this title but after 55 years of dedicative service to Indian cinema the third actor who has eventually won this rare honor is Kamal Haasan, who like the past thespians Dilip Kumar and Sivaji Ganesan has the distinction of ruling both art-house films and mainstream cinema, with unparalleled commitment and vigor. 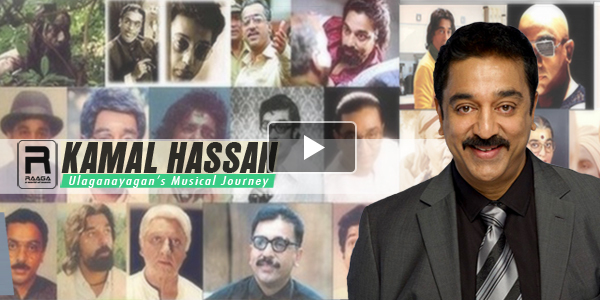 Nov 7, marks the birthday of Kamal Haasan as he turns 61; Raaga.Com wishes our birthday greeting to the legendary and versatile actor and discover why Kamal Haasan is called Thespian!!! In our quest to discover why Kamal Haasan is called Thespian we came across a cross section of his movies and found that like Dilip Kumar and Sivaji Ganesan, Kamal Haasan never repeated himself and reaped upon the fruits of a particular image like Amitabh Bachchan as Angry Young Man or Shah Rukh Khan as Romantic hero or Rajinikanth as ‘Action Hero’. Instead he ventured into doing roles that have never been attempted and surprisingly he succeeded in his mission both commercially and critically. For instance MOONDRAM PIRAI, directed by Balu Mahendra, was a love story that was complete out of league but Kamal dared and the result he not only won National Film Award for Best Actor but the movie was a blockbuster and even its dubbed version SADMA, in Hindi did fantastic business. In contrast in Shankar’s INDIAN, Kamal played a dual role, as father and son. The movie was a commercial thriller but in the role of an angry old freedom fighter, who is out to kill the corrupt official, Kamal left an incredible impact. The movie once again fetched him National Award for Best Actor. Likewise Kamal Haasan did not hesitate to be part of a silent film PUSHPAKA VIMANA directed by Singeetam Srinivasa Rao. Once again the Hindi version PUSHPAK did great business. Another outstanding classic is APOORVA SAGODHARARGAL, where Kamal took the Indian cinema by surprise by playing a dwarf!!! And last but not the least in Mani Ratnam’s timeless classic NAYAGAN, Kamal Haasan, not won national acclaim but also won international recognition. Its Hindi remake had iconic Bollywood actor Vinod Khanna playing the lead but he could hardly come close to Kamal’s versatility thus proving the magnificence of Kamal as an actor par excellence. In nut shell from his debut in KALATHUR KANNAMMA, when young Kamal was just six years old he had proved that he was here to stay by winning the prestigious President’s Gold Medal for his sensitive performance in the movie. The highlight of the film was young Kamal was pitted against maestro actors like Gemini Ganesan and Savitri, yet he went ways winning the highest honor! Now you know why Kamal Haasan is called thespian!! !